The Woodfords Club welcomes men and women from all walks of life to RELAX in a comfortable setting. 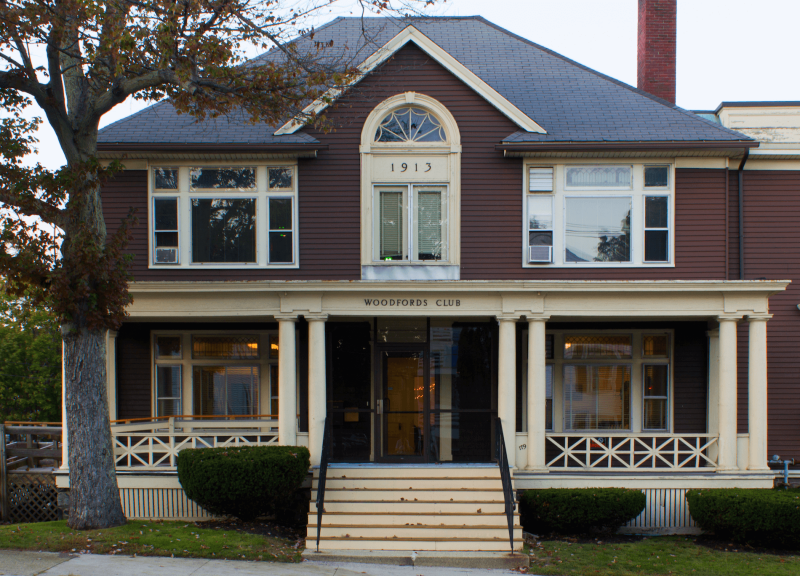 At the Woodfords Club, we've been building rapport, goodwill and lasting friendships in Portland, Maine since 1913. The club offers a wide variety of social activities ranging from cribbage, bridge, billiards, bowling, and golf to simply enjoying a good family-style meal together once a week, followed by programs that are both informative and entertaining. Come join us! The Woodfords Club's spacious main hall and attached commercial kitchen accommodates up to 250 guests and is a popular venue for wedding receptions, business events and many special occasions. First-floor meeting spaces are also available for smaller events. From lectures and movie screenings to performances and fundraisers, the Woodfords Club is an ideal community gathering place. The main hall includes a stage, attached commercial kitchen, pull down projection screen, professional acoustics and air-conditioning. The Woodfords Club welcomes members to share in the traditions of this historic 100-year-old organization. For information about Woodfords Club membership, activities, meetings, venues, and events, please contact the club at (207) 772-4893 or visit the link below to download an application. "We hosted our wedding here and absolutely loved it!! The venue was perfect, full kitchen, tables and chairs, speakers, all included. Very clean. My dad loved it so much he even joined the club afterwards!! Bonus: the parking lot is huge and location is great! We had a blast! Our guests danced all night. Thanks again, Woodfords Club!" "I'm a third generation member of the Woodfords Club (40+ years). I've had great experiences, including Friday meetings with fine meals and programs and challenging activities such as pool, bowling and card games (some of which I now play year-round). Above all, I have met some great people and made new friends." "I joined the Club many years ago and have seen many women, men and families welcomed into membership since. I have enjoyed serving on the board, meeting new friends, playing pool upstairs, bowling, and chef-cooked Friday night dinners with entertainment!" "So wonderful to meet so many new people and to be able to play bridge weekly."